has been at the forefront of peaceful anti-government protests since 1988.
to the hottest time of day, and he is being denied access to religious books. largely concerned with education policies and practices. officials and the presiding judge for a lawyer the request was ignored. The prisoners were denied the right to speak in their own defence. authorities claimed that the demonstrations were intended to create unrest. and Tun Myint Aung had distributed leaflets and organised demonstrations. given sentences ranging from seven to twenty years. was subsequently transferred to Mandalay Prison. Division. He was reported as suffering from malaria and typhoid. 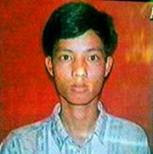 according to his mother Mya Yi who went to see him at the prison on 19th January." calls for his immediate and unconditional release. My attendant: nokia blog. Is it possible to commerce link with you?